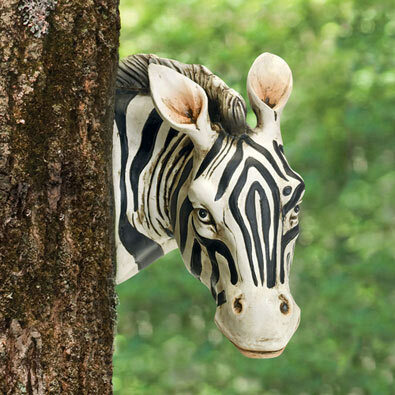 Hang this whimsical zebra head on a tree, fence or post and create the illusion of him peeking from behind it. A touch of unexpected fun for your yard. Sculpted of hand painted, weather-resistant polyresin. Keyhole hangers on back to secure with your nails or screws. Measures approximately 8" long x 3" wide. Hang this whimsical giraffe head on a tree, fence or post and it creates the illusion of a giraffe peeking from behind. A touch of unexpected jungle fun for your yard. Sculpted of hand painted, weather resistant poly resin. Keyhole hangers on back to secure with your nails or screws. Measures approximately 8" long x 4" wide.